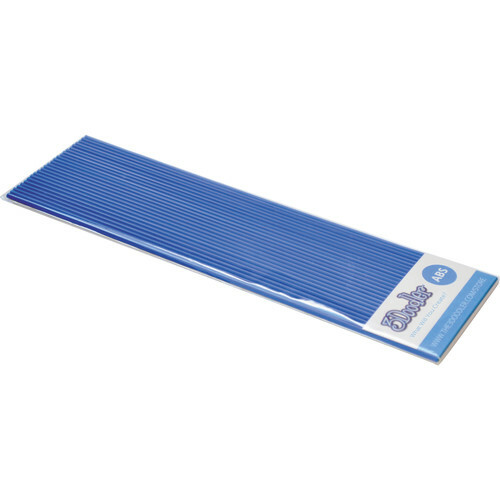 These ABS Plastic Strands in "grand bleu" from 3Doodler come as a pack of 25 and are for use with your 3Doodler pen. Each straight-cut strand is 10" long and 3mm in diameter. Box Dimensions (LxWxH) 10.05 x 3.1 x 0.3"
ABS Plastic Filament Strands for the 3Doodler (Grand Bleu, 25 Strands) is rated 4.5 out of 5 by 2. Rated 5 out of 5 by cowboy1brian from Glow In The Dark 3D strands are awesome I really think these glow in the dark strands are the coolest thing in the world. Rated 4 out of 5 by Anonymous from Fun abs doodling has a good glow per light recharge. Fun to play with the kids.